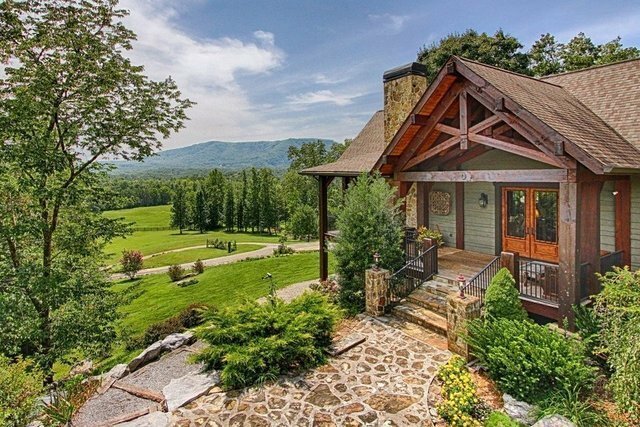 On a rare occasion a property of this caliber enters the market and provides an exacting list of all the amenities desired when seeking the Tennessee lifestyle. Starr View Farm is an amazing discovery and the epitome of Farm and Ranch living in the South. 50 prime acres of unspoiled beauty which looks prominently at ''Starr Mountain'', part of the Cherokee National Forest, with commanding, long range mountain views. Aptly named, Starr Mountain is truly magnificent with a view of the stars from the front porch on a clear night with no other lights around. Architecturally designed as a Parkitecture, a unique style developed in the early-mid 20th century in the United States National Park Service that harmonizes with the natural environment, it provides a rich history recalling the beautiful old lodges with large exposed timbers that fit naturally within majestic landscapes. A home built with all the modern day conveniences and yet boasts aged, natural materials and rustic charm. Constructed with post and beam sourced from local sawmills and 100+ year old recycled barn wood used for the floors, stairs, bar and wine cellar, combined with authentic natural stone and native woods that all contribute to the warmth and character of an older home. The main lodge-style home with soaring timber frame ceilings, gracious living/entertaining spaces, a gourmet kitchen with Viking professional range and Butler's pantry, impressive Master Retreat with walk-through shower and soaking tub by the fireplace, a loft study, downstairs entertainment room complete with full-service timber frame constructed bar and wine cellar, and an abundance of storage with room to expand, are just a mention of the highlights. The outdoor living spaces blend seamlessly with the interior and enhance the entertainment opportunities or simply provide a quiet place to begin a day or unwind at the end and take in the sounds of nature and amazing views. Just steps from the main residence you will find quaint, private, guest quarters with an additional 1100 sq ft, two bedrooms and a full bath. Along with the over sized three-bay garage there is an architecturally designed RV port to accommodate a Prevost bus. For the Equestrian enthusiasts the property features a stunning 3600+ sq ft two-story bank barn with all of the amenities...cathedral ceiling, open floor, 5-stalls, covered shed, hay loft, tack, feed room, wash station, office, etc. Designed to accomodate farm equipment on the second level as well as provide the option of conversion to another residence or other use. Close by is a 60' diameter wood-sided round pen and a separate 12'x40' covered run-in shed, approximately 25 acres of fenced pasture and a total of 50+ acres of cleared pastures suitable for cattle or other livestock. Shoal Creek runs through the property along with a year-round spring. There are 3 (+/-) miles of existing cleared, wide, hiking and horseback riding trails with elevation changes of 400' highlighted by endless mountain views as well as tranquil streamside and pastoral views. Located outside the town of Tellico Plains, known as the "undiscovered gem" with its natural beauty, small town charm and emphasis on outdoor culture as well as close proximity to major cities such as Chattanooga, Knoxville and Atlanta. Nationally designated a Trail Town with many hiking and horse trails, kayaking, hot spot for fly fishing and the Gateway to the Cherokee National Forest it is quickly receiving well-deserved recognition. Optional acreage offerings available upon request. Starr View Farm...in all its grandeur remains a warm and inviting place to call home.